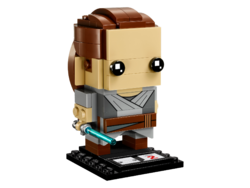 41602 Rey is a Star Wars BrickHeadz set released in 2018. 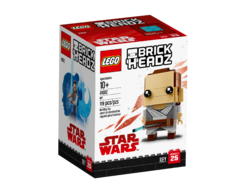 This LEGO® BrickHeadz construction character featuring Rey is fun to build using colorful LEGO bricks that recreate all of her iconic details from the blockbuster Star Wars: The Last Jedi movie, including decorated torso and belt. She also has a detachable Lightsaber and stands on a buildable collector's baseplate with BrickHeadz icon for easy display in your home, office or anywhere you like. This page was last edited on 9 February 2019, at 18:27.